There are twelve legislative assembly constituency in Allahabad district for the 2017 Assembly elections. They are 262 Allahabad North, 263 Allahabad South, 261 Allahabad West, 264 Bara, 258 Handia, 260 Karachhana, 265 Koraon, 259 Meja, 254 Phaphamau, 256 Phulpur, 257 Pratappur, 255 Soraon. When Uttar Pradesh assembly election 2017 is getting ready to electios new Assembly, Allahabad is not anywhere behind in the election heat. 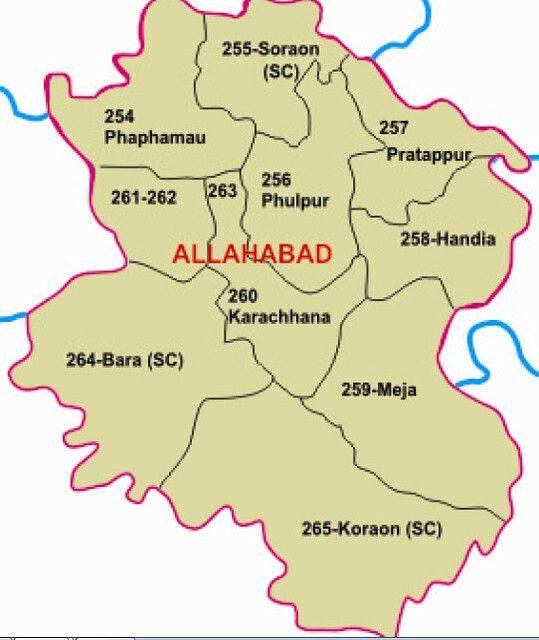 Allahabad District is one of the major & largest districts of Uttar Pradesh state of India, and Allahabad city is the district headquarters. Allahabad district is a part of Allahabad Division. Allahabad District is divided into blocks within tehsils. As of 2011, there are 20 blocks in eight tehsils.